Rent a boat in Staten Island and set sail for a good time, as you explore the many great sights of the borough. If you're in the mood to enjoy a relaxing day on the water, see our complete list of boat rentals on Staten Island. Find all types of Staten Island boat rentals. State-of-the-Art Fishing Boats in Staten Island! 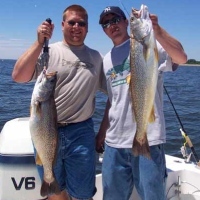 Located within minutes of downtown Manhattan, On the Bite Charters specializes in fly and light tackle fishing for striped bass, bluefish, weakfish, albacore, mahi mahi, and tuna. The fishing trips are led by Captain Joe Mattioli, who possesses a Master Coast Guard License and has been fishing the NY Bight for over 25 years! Rent out the 31-foot Ocean Master, otherwise known as "the ultimate fishing machine"! The boat will allow you to fish quickly and safely, and is powered by twin 250 HP E-Tec engines that can achieve a top speed of 50 miles per hour. The Ocean Master's state-of-the-art electronics include a 3-D fish finder and chart plotting technology. Trophy Class Striped Bass Fishing on Staten Island! 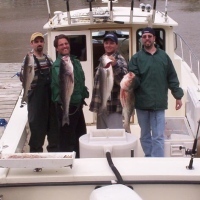 Enjoy trophy class striped bass fishing with a friendly captain and crew at Angler Charters. Cherish an exceptional day on the water as you catch plenty of fish! Other than striped bass; you can fish for fluke, bluefish, weakfish, tog, and sea bass. By renting one of the charters, you'll get access to a well-maintained vessel and top quality equipment. Since Angler is a family-oriented business, children are encouraged to come aboard. From mid-June until November, the boats are docked at Staten Island's Mansion Marina. Full day, half day, and night trips are available. A 20% deposit is required for all bookings.